Since September, the MSC Group – including the Mediterranean Shipping Company and MSC Cruises – is contributing significantly to a worldwide effort to support the affected communities and islands in the Caribbean that were most impacted by the recent hurricanes. Through its vast network, MSC has engaged in an ongoing comprehensive effort to provide meaningful assistance to the Caribbean islands in need, including Puerto Rico, St. Maarten, Tortola and Dominica. With most cruise ports in the Caribbean region now open for business, MSC Cruises, along with other players in the cruise industry, are working to support local governments in their efforts to restore normality and rebuild the damaged infrastructures on the islands impacted. 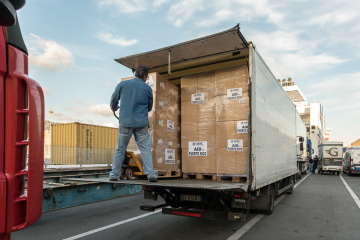 Procurement and complimentary shipping of multiple containers of needed goods, such as tons of water, food, building materials, personal supplies, lighting, mattresses, loads of empty containers for shelter and medical supplies. 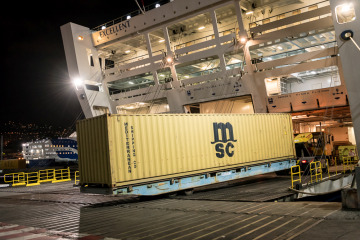 Goods were delivered through cargo containers provided by the Mediterranean Shipping Company as well through ferries provided by GNV, MSC’s ferry division. Purchase and Shipping of a Semi Permanent School Structure for the British Virgin Islands: With all the schools in the British Virgin Islands destroyed in the hurricane, MSC Cruises has purchased and shipped from the U.S. a large semi-permanent structure to be used as a school in the region. Provided MSC Cruises guests safety and shelter: Throughout Hurricane Irma, MSC Cruises’ allowed guests traveling with them and seeking safety and comfort to stay on board additional nights to ensure that they could secure new travel arrangements. MSC believes that every effort matters and has been providing special assistance to those in our community whenever we can. In one heartwarming case, a caregiver in Florida learned about how MSC Group was involved in the recovery efforts and asked if MSC could help find her lost mother in Puerto Rico. She had not heard from her mother in many days following Hurricane Maria and was unsure whether she had survived. To make matters more critical, the mother in Puerto Rico was in need of daily medication. MSC asked its local contacts if they could help and within twelve hours the mother was located and provided food and medication. MSC Group’s relief efforts are in collaboration with multiple partners and are an example of how working together – with a cross section of industries and people across the globe – we can make a real difference. Lee Holtzman of Mountain Valley Water in Miami, Marlon Hill of Hamilton Miller Law firm, Brent Stern of Cyalume Technologies, Dawn Gardner from Starkey Global, and private citizens such as Mickey Espada of Puerto Rico and Lynn Sasso of Florida, are just some of the special individuals who have all contributed their time, money and products to make sure those in need received real necessary goods. In addition, coordination with the Ministers and Governors of the Caribbean islands – all of whom are working tirelessly to restore their beautiful homelands and the wellbeing of their citizens – have made it possible to organize an extensive support mechanism and communications network so we can move quickly and effectively.